a List of the speakers that will present at the 1st summer meeting in lesvos, greece, along with the titles & Abstracts of their talks. Bridget Anderson is Professor of Mobilities, Migration and Citizenship at the University of Bristol. After a degree in Philosophy and Modern Languages she worked organising undocumented domestic workers in London in the 1980s. She walked backwards into academia: obtaining a grant to explore the situation of migrant domestic workers in Europe, and needing to find an institutional home for the grant, someone suggested she do the research as a phd and bring the grant to a university. Since then she has continued to combine her academic work with an engagement with migrants’ organisations and trades unions. She hates potted bios. Marwa Elshakry is an Associate Professor in the History Department at Columbia University who writes on a variety of topics in Mediterranean histories, the history of science and the history of ideas. She teaches a range of subjects from the History of Utopia and the History of Emotions to the Archives of Colonialism and Orientalism and Its Others. She is currently working on a project on universal histories of Islam and the history of the history of science while also enrolled in a psychoanalytic training program to investigate questions of trauma, memory and forgetting. She is now concurrently embarking on a new history of the Mediterranean Sea and its renegades and revolutionaries from the eighteenth century to present. Sarah Green is a social anthropologist from the University of Helsinki, with regional specialisation in the Balkans, Greece and the Mediterranean. In recent years, she has been working on borders and location, particularly in the Mediterranean region, trying to work out how the significance of being somewhere in particular has been changing. As part of her current research, Crosslocations, she is investigating the management of animal movements across the Mediterranean. Victoria Hattam is a Professor of Politics at the New School for Social Research working on contemporary political economy both across the US-Mexico border and within global supply chains. Drawing on a mix of political history, photography, and material cultural analysis, I examine the often overlooked policies that allow capital to move. Cross border sweeping, swift codes, financial passporting, and Bexit’s “principles of accumulation” minimize border crossings for some at the very moment that border security is intensifying. Notions of liquidity are central to the naturalization of capital mobility; liquid assets, after all, are those that move. I look forward to exploring conceptions of liquidity theoretically, empirically, and imaginatively through FLOATS. Ilham Khuri-Makdisi is Associate Professor in Middle East and World History at Northeastern University in Boston. She is the author of The Eastern Mediterranean and the Making of Global Radicalism, 1860-1914 (University of California Press, 2010), as well as book chapters and articles on Arab and Ottoman intellectual and urban history, including “The Conceptualization of the Social in late 19th early 20th century Arabic thought and language,” in M Pernau and D Sachsenmaier, eds., Global Conceptual History: A Reader (Bloomsbury, 2016). She has a long-standing interest in Mediterranean history and has taught graduate courses on it in the past. Her own work underlines connections and linkages between various shores of the Mediterranean in the late 19th century. Nikolas Kosmatopoulos teaches International Affairs, Politics and Anthropology at the American University of Beirut. He became a political anthropologist when his previous efforts - as tour guide, Santa Claus, economist, and trotskyist among others - did not yield a better understanding of the complexity of the world. Subsequent teaching and research posts in Berlin, Budapest, Cairo, Zurich, Geneva, Paris, New York, Barcelona and Beirut helped considerably, but the world kept expanding. Currently he finalizes a manuscript about the expert politics of violence in Lebanon tentatively called Master Peace. Since the participant observation on board the Gaza Freedom Flotilla he left his heart at the sea off Palestine. Laura Y. Liu is Associate Professor of Global Studies & Geography at The New School. She trained as an architect and geographer. Her research broadly focuses on community and labor organizing; migration and urban development; and the interplay of industry with art and design. In particular, much of her work focuses on the underexamined relationship between political organizing and the production of socio-spatial knowledge, especially around uneven working and living conditions. She is writing a book, Sweatshop City, which looks at the continuing relevance of the sweatshop in New York City and other post-Fordist, globalized contexts. For FLOATS, she is drawing from recent collaborative research along the US-Mexico border. Her interests there include the shipbreaking industry (the breaking down of massive merchant and military ships) and the role of seaports as land-water interfaces that are heavily militarized. Since 1987, Evthymios Papataxiarchis is teaching Social Anthropology in the University of the Aegean where he has been advisor to the Governing Body of the University for the establishment of the first Department of Social Anthropology in Greece. He has been President of this Department and member of the Senate from 2002 to 2005 and served in various committees including the Research Council University of Aegean. Evthymios Papataxiarchis is currently directing the Postgraduate Program ‘Social and Historical Anthropology’, the International Postgraduate Summer School ‘Cultures, Migrations, Borders’ and the Laboratory of Ethnography. His recent work, inspired by long term fieldwork in a border village community on the island of Lesbos, is on migration and the management of cultural difference. His is currently on sabbatical, attached as a Senior Research Fellow to the Institute of Advanced Studies, UCL, and working on the structures of ‘humanitarian governace’ and the socio-spatial restructuring effected at the local and regional level by the current refugee crisis. Charles Heller is a researcher and filmmaker whose work has a long-standing focus on the politics of migration. In 2015, he completed a Ph.D. in Research Architecture at Goldsmiths, University of London, where he continues to be affiliated as a research fellow, focusing on the politics of mobility across the Mediterranean Sea. He is currently conducting a postdoctoral research supported by the Swiss National Fund (SNF) at the Graduate Institute, Geneva and the University of Bologna. Working together since 2011, Heller and Pezzani co-founded Forensic Oceanography, a collaborative project that has developed innovative methodologies to document the conditions that lead to migrants’ deaths at sea. They also launched the WatchTheMed platform, a tool enabling nongovernmental actors to exercise a critical right to look at the EU’s maritime frontier. They have authored a number of human rights reports, including the "Report on the Left-to-Die Boat" (2012); the “Death by Rescue” (2016) report; and the “Blaming the Rescuers” (2017) report, all of which have had a major impact both within the fields of migration and border studies, nongovernmental politics and the public sphere. Based on their empirical analysis, they have lectured internationally and generated a number of theoretically innovative articles published in several edited volumes and published articles in a number of international journals such as Cultural Studies, Postcolonial Studies, the Revue Européenne des Migrations Internationales, ACME, Spheres, Global Media and Communication, Philosophy of Photography, New Geographies and the Harvard Design Magazine. Their videos "Liquid Traces" (2014) and “Death by Rescue” (2016) and “Mare Clausum” (2018) have been exhibited internationally, including at the HKW, the Venice Biennale, the MACBA and the MOMA and the ICA. Abir Saksouk graduated as an architect in 2005, and later did her masters in Urban Development Planning. She has been involved in several research projects in Lebanon, including the history of informal suburbs, the social production of shared space, and housing rights. She produced related publications, such as “This Sea Is Mine” and “Making Spaces for the Public: The Story of the Beirut's Dalieh”. Her interests include exploring how community engagement could be employed in planning and actively shaping the future of cities. She is co-founder of Dictaphone Group (2009) and Public Works Studio (2012). Nandita Sharma is an Associate Professor of Racism, Migration and Transnationalism in the Department of Sociology at the University of Hawaii at Manoa. She is the author of Home Economics: Nationalism and the Making of 'Migrant Workers' in Canada (2006: University of Toronto Press) and a forthcoming book, Home Rule: The Partition between Natives and Migrants in the Postcolonial New World Order (Duke University Press). 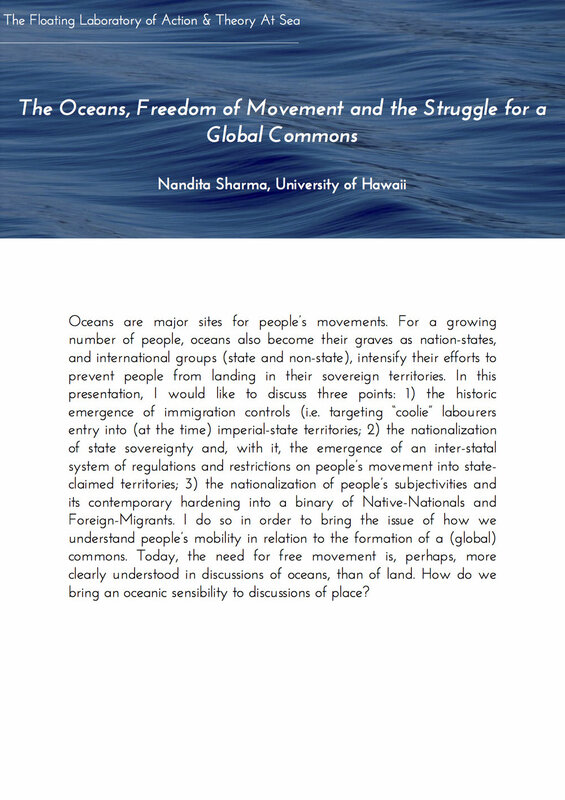 Nandita is active in No Borders networks and works towards the realization of a Global Commons. Radhika Subramaniam is a curator and writer who deploys texts, exhibitions and public art interventions as conscious forms of knowledge-making. She is interested in the poetics and politics of crises and surprises, particularly urban crowds, cultures of catastrophe and human-animal relationships. She is Assistant Professor of Visual Culture at Parsons School for Design/The New School where she was also the first Director/Chief Curator of the Sheila C. Johnson Design Center from 2009-2017.